We really enjoy working in this lovely suburb of London with the added thrill of the connection to the England rugby team. Some of my most memorable events have been doing hog roasts in the gardens and parks around Twickenham. Hog roast Twickenham is really enjoyable as it is mainly a very tranquil urban area and means that we get to see a lot of the sights and sounds on our travels. 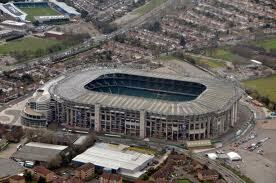 There are a number of areas that we cover, as well as hog roast Twickenham itself. Some of the towns and areas that we do a Twickenham hog roast in are just as picturesque and pleasant to work in, but there are a great number of functions that we cater for that tend to be quite remote. For example, one of our more remote events in the past few months was at the Twickenham Scout Centre. This event was an International Scout Jamboree, where young scouts had come from all over Europe. It was a large group of 150 boys and girls of all ages, who were doing a wide range of activities when we arrived. The hog roast Twickenham was due to be served as part of an evening meal by the campfire, so we set up the machine in a sheltered spot and let the pig cook for six full hours. As we were in a very busy area we could not go far whilst the pig was cooking. Approximately an hour before we were due to serve, we set up our serving area and cut our rolls. Sometimes this part can be done earlier but as the weather was quite changeable on the day, it was best to keep tablecloths, rolls and napkins etc. out of the elements. The tables are set up under the gazebo with napkins and cut fresh rolls in a basket on one table and sauces and crackling on the other table. This ensures that when there is a large number of people wanting fed at once that the queue keeps moving. There were two members of staff at this event which meant that one could continually carve whilst the other served the guests. After we started serving, it was not long before everyone was fed and every last scrap of meat had been eaten. It was really good to see that the hog roast Twickenham was enjoyed by all at the Scout Centre. As we cover quite a busy area, catering for large corporate events keeps us busy; hospitality for local companies, public events, private parties and weddings are growing in popularity. 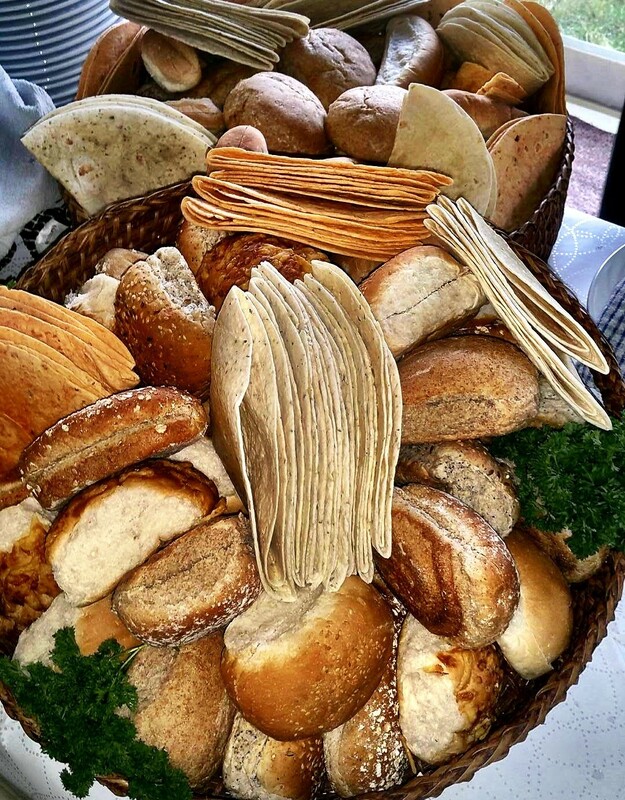 We often cater at local events like food festivals and other similar types of events. We cater for a large number of weddings in the Twickenham area, as well as some in other areas surrounding the beautiful River Thames. 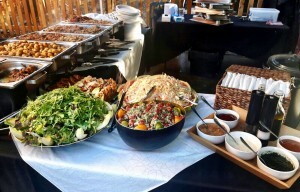 Our wedding catering can range from doing a Twickenham hog roast as an evening buffet, often at local hotels, to catering the entire function from champagne and canapés, right through to a three course meal followed by teas, coffees and wedding cake dressed on a plate, and even to an evening buffet. All of this catering can be done in a special venue or in a marquee built especially for the wedding itself. As hog roast Twickenham catering and the surrounding areas continues to grow, so does our dedicated, professional and friendly group of staff who are happy to help with any of your needs.